This was when a group of Congress supporters arrived and questioned her credentials alleging that she was a paid worker of the BJP. The woman, who had #MainHoonChowkidar tatooed on her palm, rejected the allegations made by the Congress supporters. She said that she was a student and her exams were on 25 March. 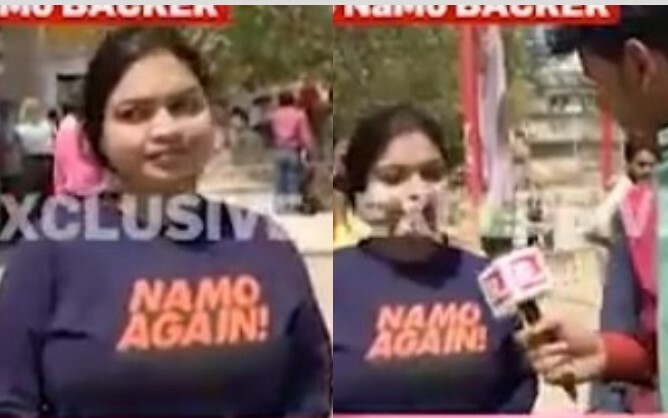 Vishwakarma also said that every single girl from her college will wear NaMo Again T-shirt. 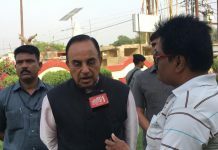 Sensing that the matter could spiral out of control, the Republic TV representative decided to end his interview, but by then the Congress supporters had begun to raise Chowkidar Chor Hai slogans. It was at this moment when the BJP supporting woman alleged that the Congress supporters had touched her inappropriately and pushed her. She also accused the local police of siding with the Congress supporters. After arriving in Varanasi, Priyanka Gandhi Vadra performed aarti at the famous Assi Ghat. Priyanka was recently appointed as the AICC General Secretary in-charge of UP East. Congress party as a whole is full of goons. Either educated or illiterates. What else one can expect from them. Including rahul gandhi all are experts in shouting.